You've seen his explanation of a combination lock's inner workings. You'll never lose another game of Jenga, thanks to his winning wooden pistol. And nearly 4 million YouTube users have marveled at his wooden marble machine sculpture. He's Matthias Wandel, and he's accomplished what most only dream of—turning a hobby into a career. Matthias has been tinkering in woodworking since he was a child, with unrestricted access to his father's workshop, permitted to use power tools unsupervised from a young age (which would make most parents cringe these days). During his engineering work at Canadian-based Research in Motion, he continued building wooden contraptions as a hobby, eventually adding a woodworking component to his personal website. "I noticed it was doing well, so I decided to expand on that a bit and make a separate website. It's grown quite a bit since," he said. In fact, it's grown so much that he "retired" from his work at RIM to focus on his passion. "It's a good way to pass the time, and it's satisfying to have an audience." All of Matthias' creations arise from his home workshop, and when it comes to birthing ideas, not everything is instantly conceptualized. "Usually, it's scratching an itch. Most designs gestate for a long time before I even sketch anything on paper. That is, I keep thinking about the problem and how it could be solved before I actually start. The pantorouter was unusual in that I made a major design change as I was experimenting. Usually, I have the concept pretty much worked out in advance." If he's trying out a new concept, he starts with wood. If it's something he's certain will work, he goes straight to making a CAD model. But a lot of his work is actually improved versions of his previous work, like his Marble Shooting Crossbow. Q. What possessed you to build the Marble Shooting Crossbow? A. My dad had some bands of spring steel in his scrap pile that I could use. The marble shooting crossbow was actually crossbow number three. It sort of solved the 'losing the arrow' and 'breaking the arrow' problem that I had with the previous ones. Plus, I could hurl the marbles much faster than an arrow. I really ran into problems with my second crossbow, in that it could shoot arrows really fast, but that it was very difficult to build arrows that would withstand the impact, even from a piece of soft wood, let alone any other materials. Q. 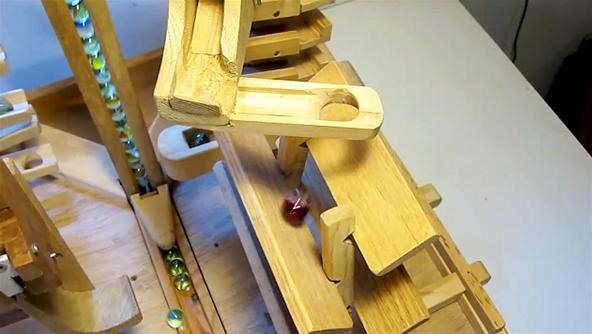 Why the wooden Marble Machine? A. In Christmas of '96, me and my brother Markus spent time making marble machines out of Legos. I thought that it was a shame that the machine we built was only made out of Legos, so I started experimenting with a more permanent wooden version. This became what I now call Marble Machine 1. I started by tinkering around with building a marble pump embodying the same principles as the pump in the Lego marble machine, but this time out of wood. Although the principle was the same, the arrangement of some of the parts were different. The build details are available here. Q. 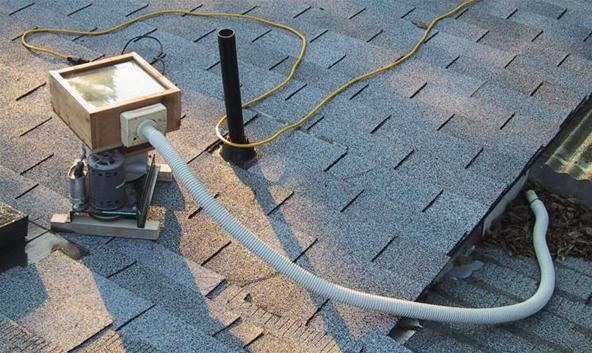 Why not just use insecticide instead of making the Wasp Sucking Machine? A. What would be the fun of insecticide? Plus, when I built that machine, there was a wasp nest under a building, with only a crack in the foundation visible. I had a blower that was perfect for the job, so it was an experiment. 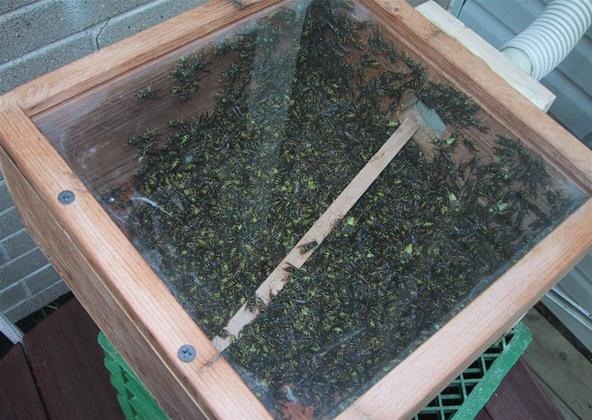 There was also a guy at work who was deathly afraid of wasps, so to be able to show him a whole box full of them, and to shake it, I thought that would be cool. But I never took the box into the office—the thought of it somehow getting opened indoors was a little scary. Further details on the wasp sucker can be found here. Q. What do you do with your Mini Tank? A. It was something I built when I was about 16 or 17, for fun. And having two wiper motors that were perfect for it had much to do with its creation. Two decades later, I figured it would be a cool article for my website, so I dusted it off, sanded the parts to make it look new again, and shot the video. It was fun playing around with it again. See how it was built here. Q. 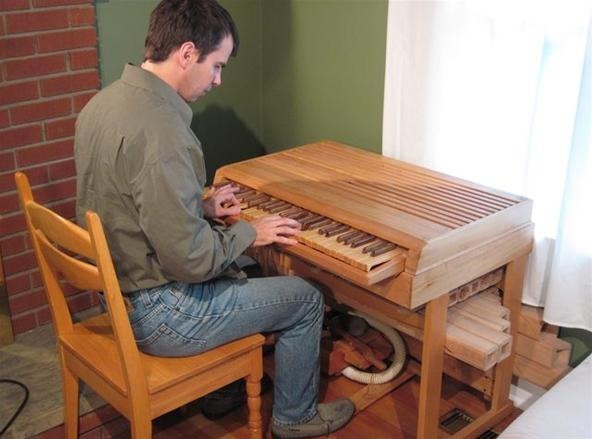 Did you run into any complications when building the Pipe Organ? A. It started as an experiment that sort of worked, and I took it from there. I actually ran into fewer complications than I had anticipated. 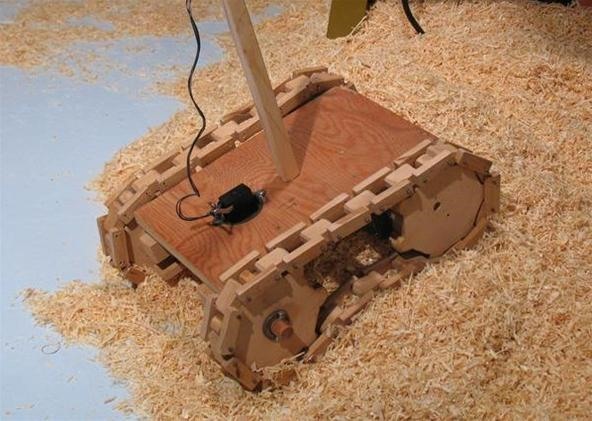 I ran into difficulties when I burned out a vacuum cleaner motor running it at a low voltage. I realized afterwards that the design of the commutator on that motor relied on running fast enough to clear the carbon dust between the contacts by centrifugal force. What killed the original motor was carbon dust accumulating in the commutator, shorting it out, and carbonizing the insulating plastic. So, cleaning out the carbon dust didn't fix it. Also, I didn't know much about scaling. I knew it was right to vary the relative geometry of the pipes as they scale, so that the length to width ratio of the base pipe was larger than the treble pipes. But I varied the ratio too much. Partly because I didn't want the base pipes to be too large. So the midrange tends to overpower the accompaniment in a lower octave. There are more details on the pipe organ design and construction here. Q. Any advice for future contraption makers? A. Start with motors. But it's hard to find suitable motors. The wiper motors from the tank were pulled out of an old '60s wrecked Volkswagen Beetle. But most wiper motors are unsuitable, so you have to find a gear-head motor that's suitable for your projects. And there's a wealth of information on the web. Read up about it on the internet and then experiment. If you're interested in recreating some of Matthias's projects, he sells building plans on his website. These projects are really great! The pipe organ is amazing! I bet it took a lot of time, especially since it says on your site that you spent 4 months fine tuning the pipes! Now that's dedication.